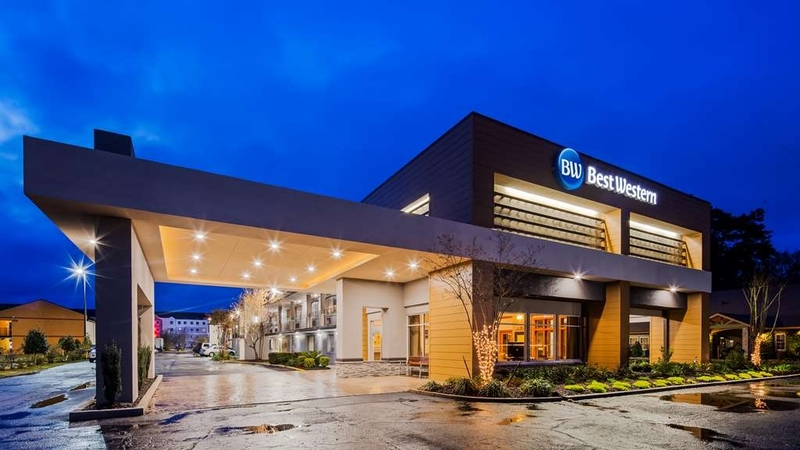 Il Best Western Covington è situato nel centro di Covington. L'hotel è vicino alle principali attrazioni turistiche. Approfittate tutto l'anno del miglior prezzo garantito e di offerte esclusive. 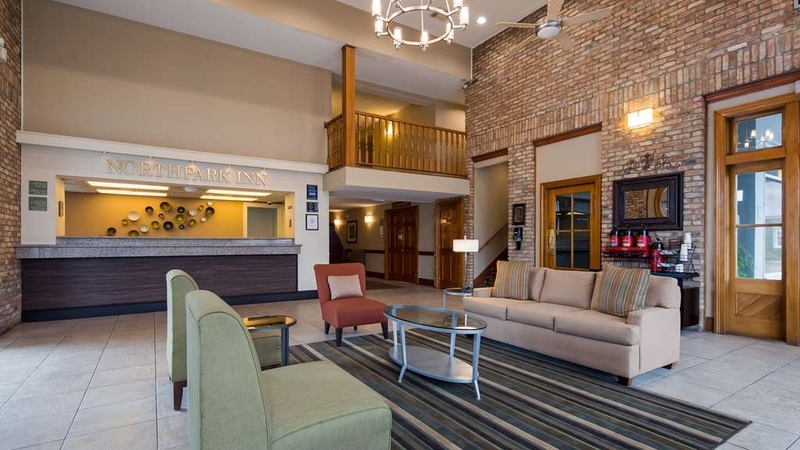 Benvenuto al Best Western Covington, situato sulla lato Northshore di New Orleans nella splendida città di Covington. L'hotel è situato in posizione ideale nelle vicinanze dell'Interstate 12 e a breve distanza da molte delle più famose attrazioni locali, tra cui la Abita® Brewing Company, gli stadi e il centro storico di Covington, ricco di fantastici ristoranti, negozi d'antiquariato e gallerie d'arte. 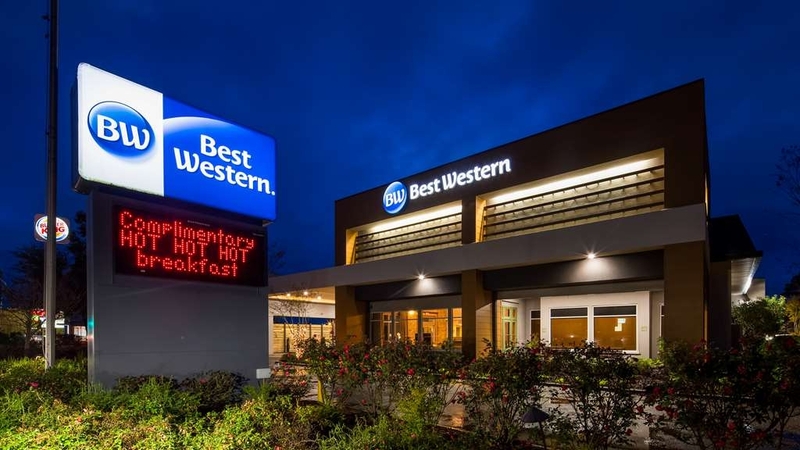 Il Best Western Covington è a pochi minuti dal Northpark Office Park e da altre importanti aziende locali come la Chevron e il Wal-Mart Supercenter. 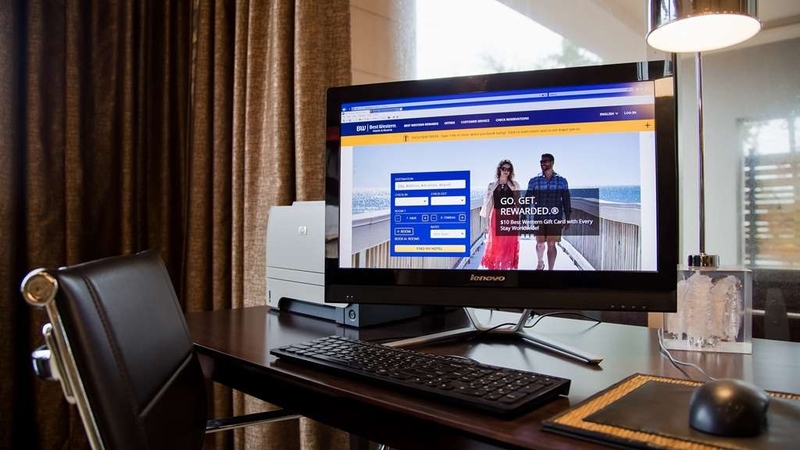 Il quartiere francese di New Orleans è una destinazione di prim'ordine per i turisti e si trova a meno di 45 minuti in auto!Il Best Western Covington, ristrutturato di recente, dispone di 72 camere non fumatori con accesso Wi-Fi a Internet gratuito e business center. Tutte le camere sono dotate di minibar, microonde e macchina per il caffè da una tazza. Organizza il tuo prossimo evento o riunione nella nostra sala meeting da 85 metri quadri. Goditi il relax presso la nostra piscina all'aperto e approfitta del centro fitness per mantenerti in forma. Non perderti la nostra colazione all'americana gratuita, che comprende waffle preparati al momento, frutta, yogurt, cereali e caffè 100% qualità arabica. L'hotel dispone, inoltre, di un numero limitato di camere in cui sono ammessi gli animali domestici. Il Best Western Covington è un hotel eccezionale, con tutto ciò che serve per lavorare, rilassarsi e divertirsi! This was a great place to stay. We where going to see Hamilton in New Orleans and it's just a 45-60 minute drive. Best price in the area and easy access. The rooms were very clean and roomy. The breakfast was very good and had a great variety of foods to select from. Would stay here again. One can be assured of hygiene. The staff is efficient and care for a traveler's needs. I have stayed for years now, family related on holidays and such. The coffee is there, the breakfast is hot and complete. Mary and the desk are wonderful. 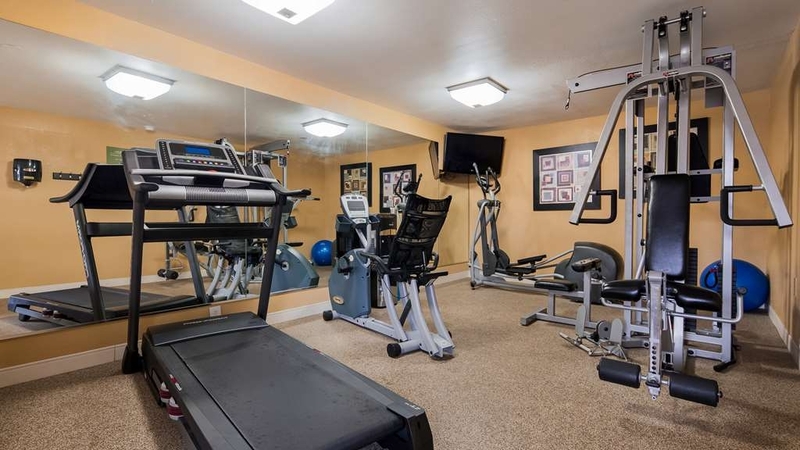 It is a more than fair price for all of the amenities, and staff always asking if you need anything. I have stayed at 5 motels crossing the US on I 10. All are different chains or independents. For the cost, quality, cleanliness, amenities, maintenance and value CLEARLY this was my best experience. They are welcoming and have a pet friendly walking area. "Refused to refund a room I'd booked for a cancelled event, then reserved it for another party"
As soon as I received notification of my cancelled event I called the hotel and the Best Western customer service to attempt a cancellation. I was told a cancellation would not be possible so I decided I'd stay in the room anyway. When I arrived, very tired after a long drive, I was told that there was no reservation under my name and that there were no rooms available. The lady behind the desk apologized profusely claiming that her general manager would be upset that this situation occurred and would contact me the next day to seek resolution. When I didn't hear from him I called his Best Western and was forwarded to his voice mail. Best Western customer service investigated and found that the hotel booked my room to another person after charging my credit card for the night prior to my original reservation. Dear Bettyrubble, As I explained to you the same day you called me, the reservation was a non-cancellable reservation. The reservation was made thru the BW Res Center under one name and on 2.21, the BW Res Center sent an update with a name change. When you arrived, you were attempting to check in under the original name - that is why we could not find it. To be sure there was not an error on our part, the BW Res Center confirmed to me that they received a call on 2.21 requesting the name change. THIS NAME CHANGE WAS NOT GENERATED BY THE HOTEL. this was a few minutes after you had called us directly attempting to cancel the res. As soon as we received your call attempting to cancel, we did pre charge your card in advance per the terms of the reservation. I did leave you a detailed voice mail message that same day after our initial conversation explaining this. I hope this clears up any misunderstanding your reservation. Best Western is the best hotel I have ever stayed at! I highly recommend people staying at Best Western! 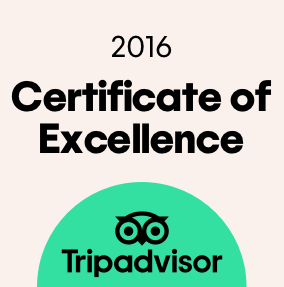 The price is great the rooms are great and the staff is excellent! They will do whatever it takes! We are staying here now and would leave had we not already paid in full. IT IS SO NOISY. People are in and out at all hours of the night with cars and trucks rumbling, doors slamming, beeping, dogs barking. We have gotten no sleep. We have a dog with us and she is so on edge because of all the ruckus. The room is basically in the parking lot so you can't get away from it. At 2 am last night, someone loaded and packed their entire car - open door/close door/open door/close door. Around 6 am, some little dogs went bonkers and sounded like they were trying to kill each other. We also had to pay a $30 a night pet fee when we arrived since we booked through hotels.com (it was in the fine print that was found after clicking through several hidden links.) You would think when a listing says "Pet Friendly" and you book and receive your confirmation with no mention of a pet fee, you aren't going to receive a $200 surprise when you show up. 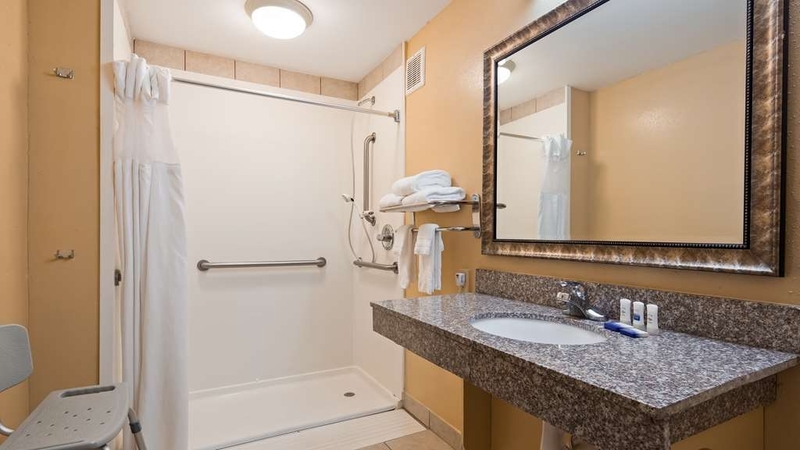 This place also isn't particularly nice or clean - there was a used bar of soap in our shower, the tissue box was empty, and our shower leaked around the curtain and the towels were filthy after we dried the floor. We even had a towel with hair all over it. The bed isn't terribly uncomfortable and the pillows are okay - the blanket smelled perfumey so we just didn't touch it in case it was not washed. Just about the only redeeming quality is the breakfast and the guy who cooks it - a great selection and he is really friendly. The day manager is also really nice - she seemed pretty grossed out by our towel situation. A wonderful stay. Very friendly staff, from the front desk, the breakfast cook & the crew cleaning the rooms. A very clean & nice room. Very accommodating with our dog. Most definitely look forward to staying here the next time we are in the area. Would stay there again, staff was phenomenal always so accommodating the bed was kinda hard but clean. It was quiet and I slept really well. There was a good restaurant in the parking lot and close to everything. The only problem I had with staying in the Kitchenette was the extremely uncomfortable bed. Everything else about the room was fantastic. Service was very helpful as it always is. Check in was quick as well as check out. We enjoy staying here everytime we come to the area. The staff is exceptionally friendly and professional. The rooms are comfortable, with four pillows for each bed. There are many restaurants in the area. Wouldn't stay here, is bad experience. Its an older hotel that smells and then they try to blame you for the smell by charging you unauthorized charges. Not stuff you should have to worry about if they will high jack money out of your account for fraudulent reasons. 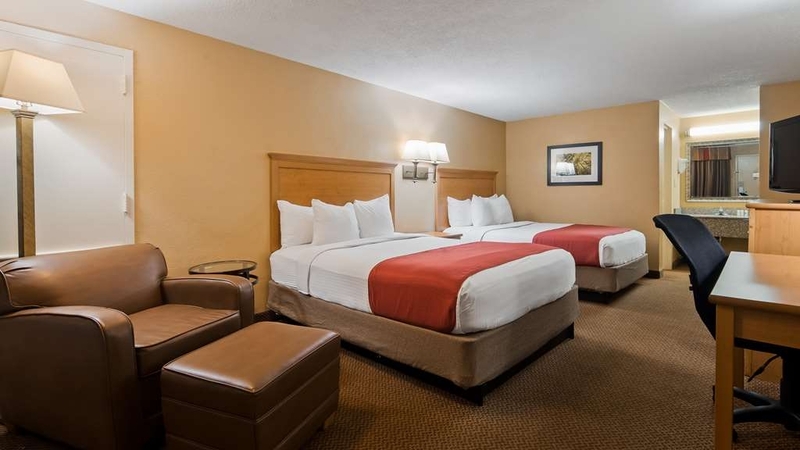 "Stay away and the assistant GM is especially unprofessional"
"Excellent location in Covington, Best Western I have stayed at"
The guests services are helpful and always courteous. Breakfest was absolutely amazing. Kat is super enjoyable to have her greet my sister and I in the morning during breakfast is simplu authentic. The rooms are clean. Wonderful experience at Best Western and will definitely spread the word to my family and friends! Ms. Caitlin, Thank you for your review. We love Kat - she does an awesome job in breakfast. Our housekeeping staff also take a lot of pride in taking care of our rooms. We are glad you enjoyed your stay!!!! "Worst BW I've stayed at"
Mr. Robert R, This really doesn't sound like us but perhaps things went terribly wrong and it us. I really would like to find out more details. If you don't mind, can you please call me at 985.892.2681 or email me at [email protected] We never ever want a guest to experience what you are reporting. One of few accommodations recommended by our veterinarian. Expected musty/dander smelling room only to find clean fresh room . 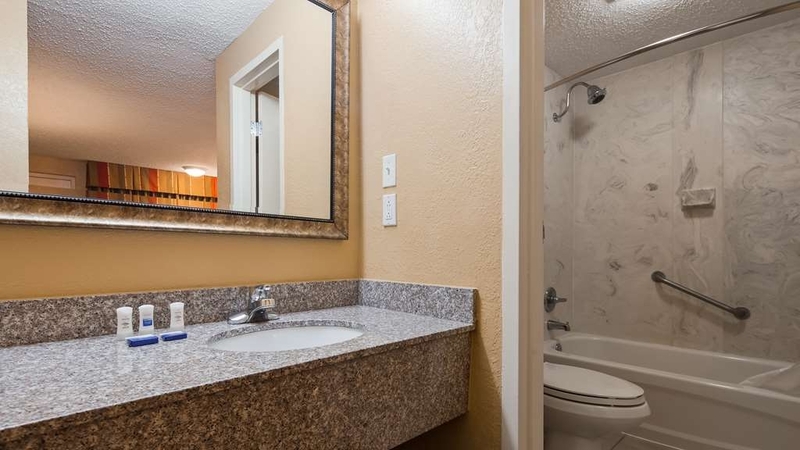 Well kept and clean for pet friendly motel. Housekeeping staff very friendly and hard working to make our stay enjoyable during pet surgery. Breakfast buffet more than just danishes and fruit. Wide array of choices, bacon, sausage, hashbrowns and more. Motel is located in area with road construction and makes entry to parking complicated . Located close to many, many dining establishments. Mr. Mark, Thank you for your feedback. We are glad you had a good stay and enjoyed the breakfast. We do offer a limited number of pet friendly rooms for dogs and hope your pet is doing better. The hotel is an older hotel, but they recently went through a complete external renovation. The manager said they didn't do anything to the rooms, but the one we were in appeared to have been freshly painted, the bedding appeared to be new and the carpet was fairly clean. The staff was super friendly and extremely cordial. The hotel offers a full hot breakfast. They have a rotating meat schedule, so, sausage, bacon, ham and sausage links. They also have scrambled eggs, toast, bagels, grits, oatmeal, yogurt, fresh fruit, waffles, biscuits and gravy. The hotel was clean and a nice place to stay for the night. An overall enjoyable time. Neslongc3, thank you for taking the time to let us know about stay. We are so glad you enjoyed the breakfast and had a good experience. We hope to see you again if you come back to Covington. Take Care!!! This is an older hotel, but the staff were so sweet and caring. They were always smiling, helpful and joyful. They made an effort to spread joy in your day every time they encountered you. If we come back to Covington, we would stay again. Thank you. Thank you for taking the time to let us know about your stay. Our staff love taking care of our guests. Safe travels and we hope to see you soon!!!! I was incredibly disappointed (and disgusted) with this hotel. We checked in around 11:15 pm after a long road trip, and the parking lot was full of what my daughter called "night creepers," who were just people standing around smoking by their cars. I had a bad feeling. The room was just as questionable. The carpet, bedding, and furnishings looked to be at least 20 years old, and the sheets and towels were covered in hairs. There were some creepers on the walls and dresser, too. In the morning, I awoke at 6:00 to the pungent smell of cigarette smoke, despite the hotel's claim to be 100% smoke free. We skipped breakfast because we were all too grossed out. I will most definitely not be returning. I was pleasently surprised by the Best Western. Comfy rooms, friendly staff, great breakfast! Will use the Best Western on my travels. This was my first stay with this hotel. I wish I had found them sooner but better late then never. Thank you for your kind comments. Our staff will be thrilled to see your feedback. We also think we offer a great breakfast and are glad you enjoyed it. Safe travels. "Great place for People with Pets"
This property is my go-to place to stay in the area. The rooms have been updated, as has the exterior. It's the best value for anyone who travels with a pet. Other properties claim to be pet friendy, but charge a nonrefundable a $50 or $75 "deposit". That's not my idea of friendly. The beds are comfy and the AC works really well. Not a big of any kind ever. The pool is kind of dislocated from the main building and it can be difficult to find the entrance in heavy traffic, but it is well worth your time to do so. There was no traffic noise once the door closed, despite the proximity to Highway 190. The staff are very helpful and will accomodate any requests you have to the best of their ability. They knew some wonderful places for supper we had never tried before - and they were right! The rates are a good value. It's a very good place to stay. Thank you for taking the time to let us know about your stay at the Best Western Covington. Feedback from our customers is very important to us. When your travels bring you back to Covington, we do hope you will consider staying with us again. Hotel is at a great location and is reasonably priced. Easy to find. Friendly professional staff. Spotless room. Fast internet. Comfortable bed. Hot breakfast. What more do you need for an overnight stay? Mr. Donald, Thank you for your feedback. Our customer comments are very important to us because they help us to improve and strive for the best service we can offer. Safe Travels. Firstly The Rooms Are Nice! The Staff Is Amazing, Very Curteous. My Stay Was Very Nice and Relaxing. I Love How The Breakfast Has Improvest Mrs.Essie .H. Is A Very Sweet, Compassionate Worker! She's very Patient and On it. Her Joy Filled The Room, Thanks To Best Western!! ashleyk32018, I appreciate your kind words. Essie is one of our newest employees and is a great assett to our team. I hope you will stay with us again in the future. I had to stay at this Best Western in Covington for a month during my management training. The level of customer service from Mary, Jason, and every member of there staff was beyond compare. 5 stars! I can't express how much they catered to my care and they made the trip worth taking. I am looking forward to taking another small personal Staycation in my new favorite getaway. This place is too good not to shout about! The staff are kind, very accommodating, skilled in personal relations, willing to listen, and hard working! They have, by their demeanor, convinced me to return! And probably not just once!! 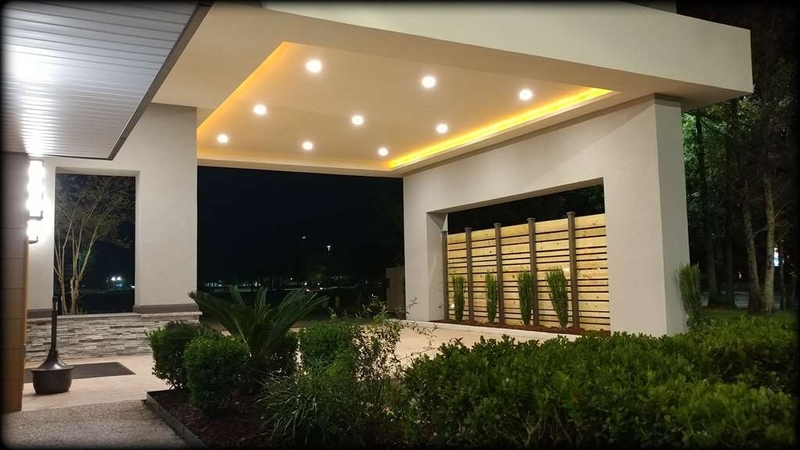 Covington was a convenient base of operations for a few days of activities on both sides of Lake Pontchartrain, and the Best Western seemed ideal. Check in was very friendly, thorough and efficient, and was followed up by a call to make sure we were settled. The room was conveniently located (first floor park at door), roomy and comfortable- the air conditioner was running when we arrived. Furnishings were in good condition, cleanliness and maintenance very good. There were many electrical outlets available and lighting was decent. One bad towel in the bunch, but the rest were good. Sleep quality is where I had the biggest issue. There was some outside noise that disturbed me, light coming in through the curtains, and the pillow-top mattress was old and sagged in the middle. Not so bad that we sought out a different room or hotel, but not ideal for three nights. Breakfast open 6am daily, good variety and well stocked. Check out was efficient but not as friendly as check-in. I might stay again. The mattress is important, and was out of sync with the rest of the accommodations. "Bad communication and business dealings"
I reserved this hotel through priceline. I searched for dog friendly hotels and was not told about an extra $30 daily pet fee until I showed up for my reservation. The front desk clerk cancelled my reservation because of the miscommunication. I checked my bank account a few days later to find that I was charged for the room. Why wasn't I told about the pet fee prior and why wasn't I told that I will still be charged if I don't stay there? You shouldn't charge someone when you failed to communicate. I am sure you ended up booking the room anyways and now you were paid twice. Poor communication and greedy business dealings. "The very best in Louisiana "
Ms. Brittney makes the best breakfast. Always hot and fresh, served with a wonderful smile and a welcoming attitude. She makes our time here so enjoyable in the mornings. She also keeps the lobby nice and shinny. Ms. Brittney is wonderful. The staff is professional and friendly. Bed are very comfortable, pillows are dreamy! Breakfast is a delicious start for the day. The workout facility looked great but I had an injury and couldn't use. We plan to stay here again and again! Friendly staff. There was a strange/strong smell in our room but it wasn't so bad that we complained. The bed was lumpy and the frame was squeaky. My husband thought the breakfast was ok, I wasn't impressed. It is a older hotel. We were able to back right up to our door for unpacking. I liked that it was close to the interstate. My wife and I brought our dog for a procedure at a vet's office in neighboring Mandeville, so this hotel suited our needs perfectly. It was close to the interstate and had everything we needed close by. Because we could not leave our dog after his surgery, having a Burger King fifty feet away for a quick bite was a huge plus. 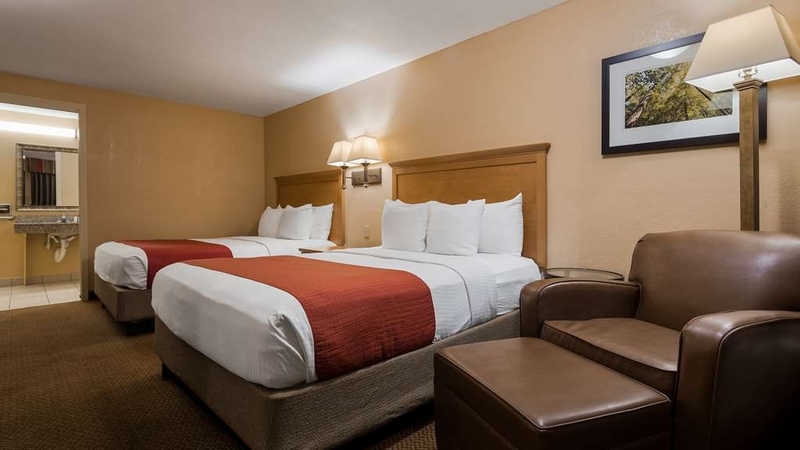 The staff was friendly and the room was clean and comfortable. They even provide a dog bed in case you forget your own; however, it is very small so the nearby Wal-mart came in handy for miscellaneous needs such as a cheap throw for our pet to lay on. We did not eat breakfast so I cannot give any information on that. The only con is trying to reach the hotel if you are trying to access the location going north on Highway 190. There is no place to cross over so you if you follow your GPS, it will tell you to make a U-turn at a stop light after you pass the hotel. DON'T DO THAT. 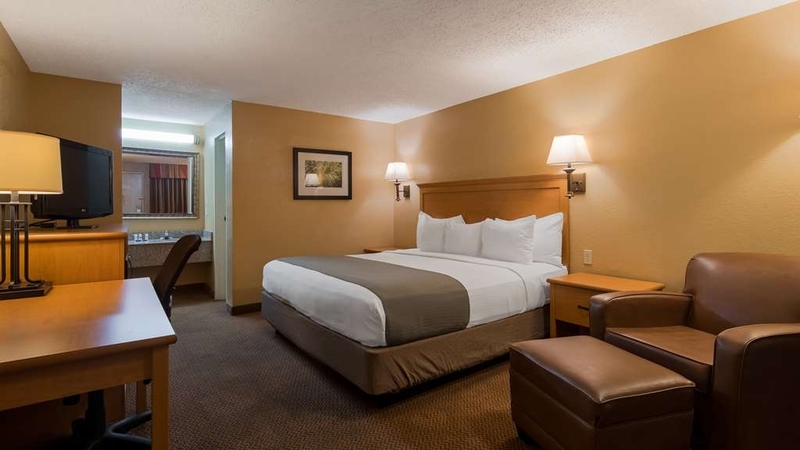 There is a much easier way: Going north from I-12, make a left at the Holiday Boulevard intersection (you'll see a Racetrak gas station on the corner to your left) and turn in to the parking lot for Country Inn & Suites on your right. Their parking lots connect and will bring you into the back of Best Western's parking lot, saving you a lot of hassle entering and leaving the property. Due to work ongoing at the house (and having a small dog) we stayed at the Best Western for 3 nights. The staff was very friendly and the accommodation was clean and tidy on our arrival, 11PM. The only reason for a 4 rating is the size of the breakfast area. Ms. Trenise - is Amazing. Her warmth and hospitality at 2am was wonderful and a perfect. She gave us advice on the area and where to go. The staff in general is incredible and always available. Ms. Trenise is the reason we will be bringing our entire family back for vacation. I highly recommend this wonderful facility. "Clean, Comfortable, Friendly and Accomodating"
"Not what I expected as a Best Western fan"
They've done their best to facelift the front of the building but the actual room wing is a typical 2 story outdoor access only using stairs. Asked about security in the parking area and told there were cameras. I didn't see any. As we walked to our room on the upstairs walkway we passed open hotel rooms with people lounging and greeting us. Hotel can't control that as is the nature of the layout but just made us uncomfortable. Opened our room door and didn't stink bad but didn't smell fresh or welcoming. This was a mother daughter trip. (Mom is senior) and this just wasn't going to work. Mary at guest reception was pleasant and understanding. There are rooms in the main section that she would have moved us to one of those rooms but they were not available. We decided to book elsewhere. Still a BW fan, just not in Covington. We always stop for a good night's sleep between our destinations. Rooms are clean and comfortable and staff is friendly and professional. Good breakfast, excellent presentation of food. If you don't see something, ask for it! 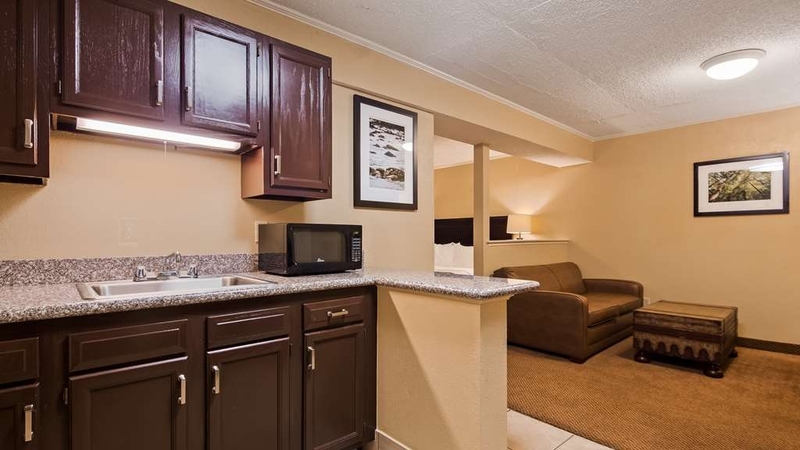 Rooms could use a little refurbish but not bad. Very clean and front desk staff was extremely helpful. Was a little difficult to find as gps took me to the wrong location. Motel is on a very busy highway, a little further from the interstate than I usually like. Coming from I12 it's on the left and the sign is a little hard to see. Rooms very clean. "Falsely Accused Me of Stealing Pillows!!! Be Careful of Them!" This hotel was ok, my daughter and I had a decent enough time there. Until I got home and discovered an additional unauthorized charge for $50 on my debit card. When I emailed requesting a refund it took them two weeks to get back to me, and when they did, they falsely accused me of stealing pillows from them!!!! Are you frikkin' kidding me? Hotel pillows, really?! You couldn't pay me to take hotel pillows. I suggested they review their surveillance video because it will show I took nothing. If you value your pocketbook and don't want to be randomly overcharged and accused of being a thief, be careful of staying here. I had reservations, and when I arrived everything was ready for me without any problems. I enjoyed varied choices of the breakfast in the mornings. I was able to park close to the door of my room. I got immediate help when I had a little problem with my wi-fi. The room was comfortable enough and although the carpet was not worn or stained it felt like it could have used a cleaning. Overall, the staff was friendly and accommodating and ready to answer questions. Check out was as easy as it was to check in because everything was prepared and waiting for me. We arrived to this motel on a whim. We usually do not stay at motels but were feeling nostalgic for our childhoods. We saw a special notice on the internet and we both recognized this Best Western. We had noticed a lot of the chain were doing facelifts and this one stood out. A modern lift to the clean, industrial look of this basic rectangular building. Tasteful exterior touches with simple yet spot on landscaping. The staff was incredible and catered to our needs with southern hospitality. Andrew and Rachel were sweethearts and the GM, Sandia Chatham, handled a tweak personally. Comfortable rooms, good mattresses and pillows with Pantene toiletries were appreciated, A great pool and easy access to local gem Rouse's Groceries and Whole F'oods. You are in civilization because of nearby Starbucks but you do not need it because the motel has Community Coffee on tap. Heaven. The biscuits and gravy on the free breakfast hit the spot for some but the fresh fruit and waffles were key for others. House keeping was very service oriented. Great Wi-Fi and cable. ***** Dakota Restaurant is across the lot and fabulous for an adult dinner. Pet friendly too! "Clean and doable for a night"
If you just need a place to stay for a night, you will be ok here. The bed is horrible though. Springs stuck in my back all night but the room was clean and the water in the shower was hot. Nothing fancy about the place for sure. Staff is friendly. Lobby is clean. They have a brown bag to go breakfast if you need it. They do NOT take cash without already charging your debit/credit card. This to me is ridiculous and was very inconvenient as a person who prefers cash transactions. This is a charming hotel with an owner who gives a wonderful welcome. Parking is right outside the room. There is no elevator to the second floor. Very delicious breakfast. Wonderful place to stay! We will definitely be back. 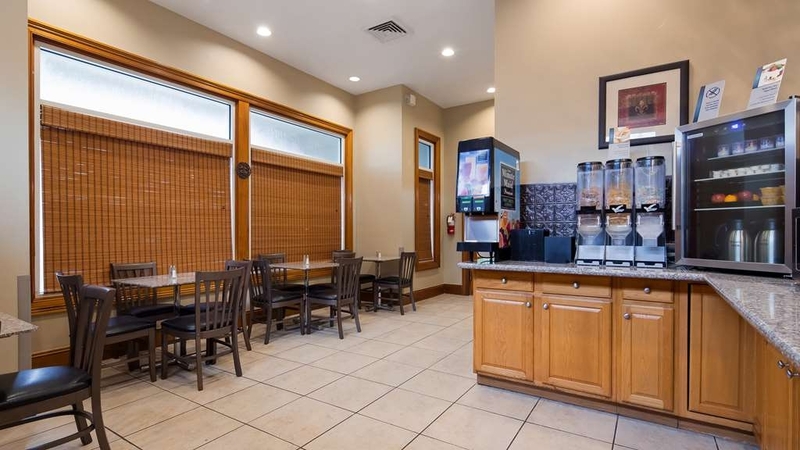 "Great Choice in Covington Louisiana"
This Best Western Hotel is an excellent choice when in the Covington area of Louisiana. Although it's an older property, with outside access to the rooms, it has been very well maintained. The room and bed were both comfortable. The room was very clean. Staff were exceedingly friendly and helpful. The only small downsides to our stay were early morning smokers talking loudly outside our ground floor room and some road noise during rush hour, because the hotel is located on a very busy main road. There are PLENTY of excellent choices in restaurants close by. Several are within a short walking distance. If our travels ever bring us to this particular area again, we most certainly would choose to stay at the property. This clean, comfortable, and very conveniently located hotel has a very friendly staff that makes it easy to maneuver around a new area. The breakfast bar was well maintained and the management was very attentive. This was a very enjoyable stay. I had a roadside emergency and had to stay overnight. They accommodated me and my pets, so thankful for that. Staff was great and extremely friendly and helpful. Would definately stay again and recommend this place to friends and family. "Stay at Best Western Northpark Inn, Covington, LA"
This was the best hotel we have ever stayed at. First, the front desk lady during the day was wonderful. She was so helpful and knowledgeable of the area. The housekeeping, dietary, and maintenance staff made us feel like family. The hotel is beautiful and decorated so nicely for the holidays. The owner was so helpful in planning our trip to New Orleans for the day. We had the best time here and will definitely be back when in the area. Hotel was great for the value, it is well kept. Staff was excellent. Breakfast was good.The hotel has been renovated, but it does show age. The night clerk (Andrew) was very helpful and personable and attended to our needs. Had reservations at another hotel but found a coupon at the state welcome center. We called and they were able to reserve us a room. It was about $35 less than the one we had previously reserved elsewhere and we're glad we did! The staff were awesome and easy location near highway, very clean and cst was right. The clerk that checked me in also gave me perfect instructions on how to get there and was the most friendly person I spoke with all day. "Amazing Staff and Clean Rooms"
We traveled 12 hours with our dog through the night to Covington. The hotel staff was amazing and called us to let us know they had a room available for early check it. That meant so much to us, as we were exhausted. The room was clean and staff was so friendly! The small pet fee is well worth the stay here! And there is a Petsmart and dog park just minutes away! 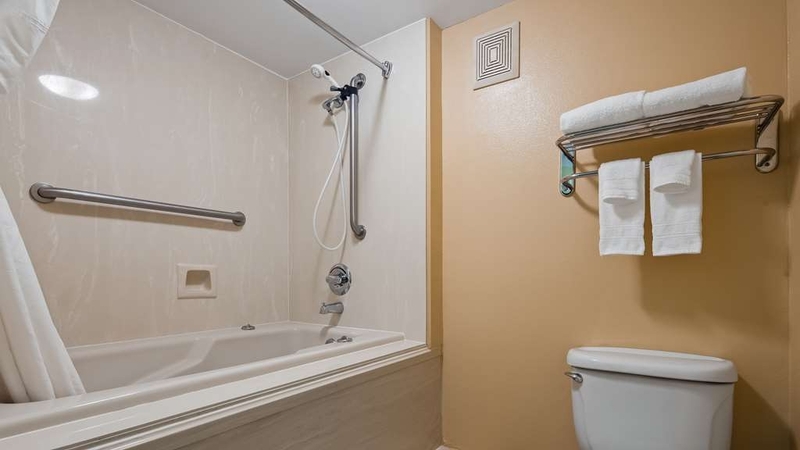 This hotel is located in an ideal location and is easy to access. The staff was very friendly and professional. My room was clean and nicely decorated as far as hotels go. The bed was perfect with 4 pillows. The reason I did not give it excellent was because the eggs on the complimentary breakfast bar were not real eggs. Otherwise all of the food was great. "It's been a great experience"
"Clean and Convenient but no elevator"
Near I-12. Nice restaurants close by. Large quiet clean rooms. Very comfy bed and pillows. Excellent internet. No elevator to 2nd floor. Doors are all outside and the walkway is sloped for rain drainage and paved with slippery river gravel. Careful with both arms full of luggage! Plenty of hot water for the shower. Electrical outlets are scarce and no USB charge convenience outlets anywhere. Superior staff. Coffee was only so so, but a staffer offered and got it for me since I didn't see where it was at first. How nice! The front desk staff members are friendly and helpful at all times. 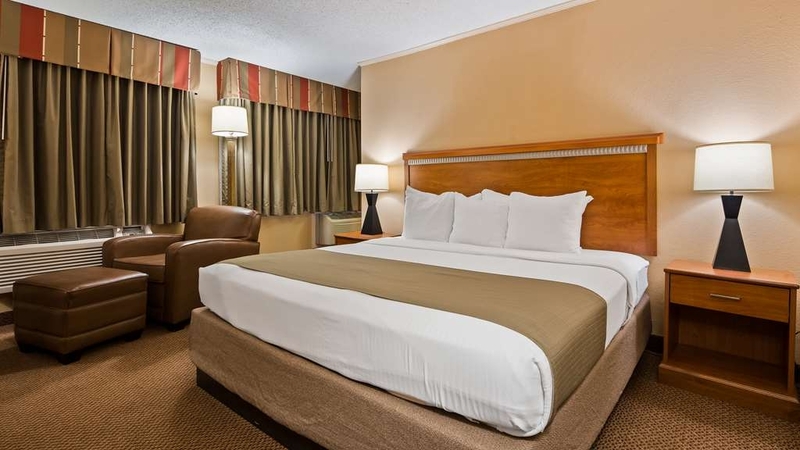 The rooms are clean,comfortable and appealing. Lots of parking areas and nearby places for food. No problems with any of my stays. Will definitely stay here again soon!! "Mary and Yvette were amazing servers and friendly!" Mary and Yvette were amazing servers and friendly. The best place i ever stayed! the room was clean! the assistant gm was just as friendly as staff. when the gm left, the staff was still amazing. Yvette is the best cook in the world. she went above and beyond with her job duties. she served the guest including my boyfriend and i.The service was fast! she cleaned the table as soon as we got up. she told us to leave our plates that she would get it, but we took our plates anyways because she was so nice. most other places the people are rude. but not here! I'm moving into town soon! and ill be sure to stop by just to have a friendly conversation with the staff! when my family comes to visit they are most definitely staying here! they brought us towels when we needed it! they gave us great advice on were to go to have fun! they wished my boyfriend good luck on his interview! He got the job and they were genuinely happy to see us happy! We argued the entire way here, but their southern hospitality brought us closer together! celebrating our fourth year anniversary here! this place is amazing! i recommend everyone come visit because of the two ladies staff members, Yvette and Mary! 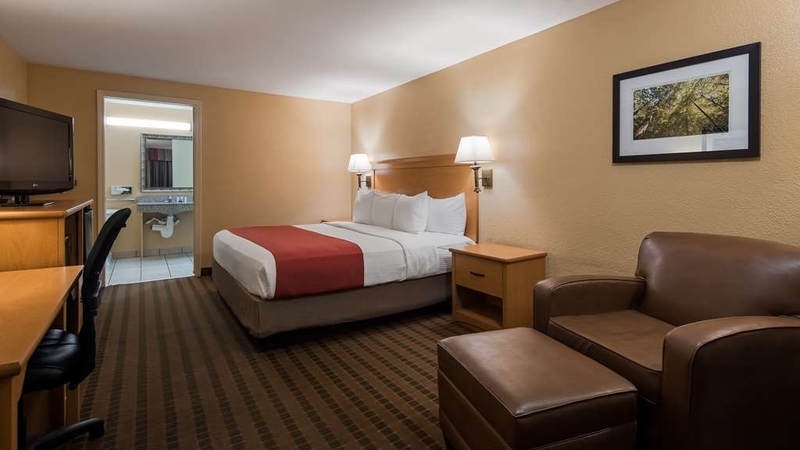 "Great Gem of a Hotel Best Western"
Bed comfy, pillows were pretty good, room clean. Pool nice! Having washer and dryer was great. Convenient to restaurants and big box stores. Breakfast was great! Employees of BW were all super friendly and helpful! Had stayed here once before during their remodel. When running from hurricane Irma, knew this place would be out of the impacted area. Jason, the manager, was VERY helpful in getting me the kind of room I needed, when I needed it. They were also very good about pet policies at this time of stress, unlike some other big chains. For this reason alone, I will be a loyal customer. 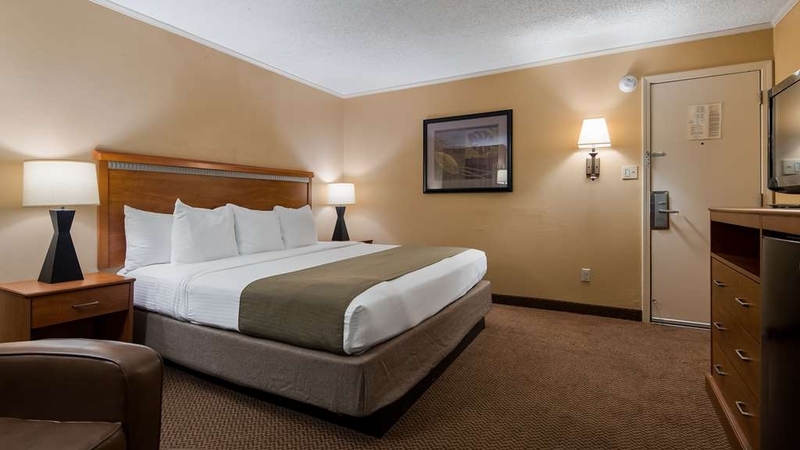 The room is certainly large enough to be comfortable, there's a nice desk with a chair which actually fits under the desk, the bed is good, and the linens are nice. Breakfast is ok but limited; there's a Waffle House within easy walking distance if you want to buy more options. 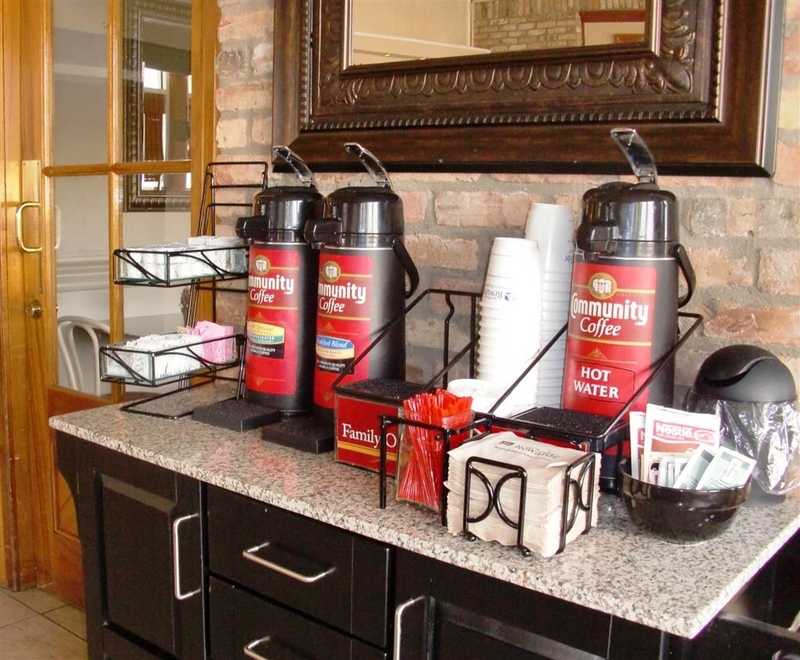 Coffee is always available, and copies of papers are free in the lobby. There's even a doggie area with pick up bags in the back. It's a great place to stay with Fido in this area, since there are few places which will a take a pet. It's kind of hard to get into from the east or north (requiring a Uturn at least), and the sign can be easy to miss, but it's sure worth hunting for. It's right down the road from the yummy Acme Oyster and Don's Seafood restaurants. Good bed, great people, excellent food options - who could be unhappy with this? I have a new go-to place when in the area. I have stayed here many times since 1998, since i'm from the area originally. This time was by far the best!! The customer service from Mary,Sherri & Andrew at the front desk was awesome! Precious &Eva did and great job keeping my room clean & shiny! The breakfast ...YUMMY!! The pool was clean and comfortable! I look forward to my next trip home!! Clean rooms, friendly staff and great location. We were traveling through to go on a cruise out of New Orleans. Will keep in mind for future business as this was a great location with clean rooms. The staff was friendly and helpful! This is a very nice hotel weather staying here for business or pleasure. Checking in to the hotel was very easy and Mary at the front desk was very professional and handled all of our requests attentively. She really makes you feel like a valued guest. Thanks Mary! :) The room was very clean and quiet. I liked the nice personalized note from housekeeping each day. I thought that was a nice touch. The hotel was recently renovated and looks very modern and has a very clean appearance outside. The pool area was very clean and relaxing to take a break from the summer heat. The breakfast was very good and Whitney working there was very polite! The lobby has a nice atmosphere and smells amazing. Will continue only staying at this hotel for future experiences! Mary, our hostess tonight, is the quintessential queen of hospitality. Perhaps because I'm a BW rewards member or maybe just because, she greeted us enthusiastically and gave us one of the prime interior rooms. The room is huge, well appointed, QUIET, and just the ticket after a long day in crazy highway traffic. If we can, we'll be back on our return trip home in a couple of weeks. Disappointed that we were not told heavy equipment noise 8 am to 5 pm daily. Our room was not thoroughly clean and towels are thin. A/c worked great. Hopefully this place will be better once the remodeling complete. BEWARE: If you're looking for the worst hotel experience of your life-you found it! As soon as we walked in the room, roaches started scampering. We were greeted by a lethal looking large spider. This coupled with the smell of mold had us return to the front desk where we were assured that Priceline, who we booked through, would get the information & we would receive a credit. Guess what, neither the hotel nor Priceline will provide any credit. I left immediately and booked a room with a Marriott. This is a flop house motel-Best Western & Priceline should be ashamed!! This Best Western was under renovation and there was water and mud outside the rooms which made if difficult to get you luggage, etc into the room. Breakfast was below average, did not see and one there to service you if necessary. We had a great time. Took the grandkids swimming. The rim was clean and the bed comfortable! We would stay here again. Staff was very helpful and nice! The breakfast was nice and enjoyable. Loved the waffles! See you soon! The room smelled bad, bathroom towels were clearly dirty. We had construction workers outside the room at 7:30 working. They first tried to give us a room (we have little kids) with a wheelbarrow and cement mixer blocking the walkway. Check in lady was rude about moving rooms. This is an older hotel that has had some upgrades in the rooms but the exterior is a bit shabby and the current construction further detracts from first impressions of this property. The rooms are clean, bed comfortable and breakfast was good-although breakfast room is very small. There are many restaurants in the area but difficult to walk because of the busy highway in front of hotel. Perhaps the renovation will be an improvement but for now I think there are better options in the immediate area. I understand hotels need to be renovated. However you should be given warning. When I showed up it was far from what I expected but was willing to try. After having to sign a waiver saying I would not park there from 7:30-5, I went to the room. It was small and smelly and there was an alarm going off. That was just to much. I didn't bother to stay. Wonderful and kind staff who were attentive to all of our needs at a very difficult time in our life. From the time we arrived until checkout, we were treated with the utmost care. At a time when we needed assistance, they were there for us. The property was under construction, but from the time we walked in until we left, that did not in anyway disturb our stay. "Best Western almost got me shot!!!" Worst hotel experience ever! Desk operator Michael was incompetent. My family arrived just before midnight, exhausted, and were put into a room only to be called at 1:00am to move rooms!!! We woke up my daughter and gathered all of our luggage to move rooms at 1:00am because Michael put us in "the wrong room" and told us we'd be compensated for moving. So we go to the next room he gives us keys to and as I'm opening the door a dog starts barking from inside the room and coming towards me!!! I quickly pulled the door close because I realized there were already people in the room! Oh my Lord! Best Western's incompetence almost got me shot!!! Seriously we are so lucky that the people sleeping in room didn't shoot us! So I went back to Michael at the front desk only to be told that the only room now available is a pet room and sorry that we don't have a pet with us but we'll be compensated. We were told there were no rooms available at any other hotels in town because of a lacrosse tournament in town. Y'all I just wanted to go to sleep! We'd already been on the road for 5 hours and had to drive another 7 hours the next day. The pet room stank to high heaven but we had to sleep. We slept in the room thinking we were not going to have to pay for this crap BUT guess what?! Best Western will not refund the money because we booked with Orbitz and Orbitz will not refund the money because they spoke with the hotel manager Jason and he doesn't want the money refunded to us. The manager Jason did call to apologize but yet he's not willing to return our money to us! So heed my advice and DO NOT STAY at this hotel. They do not care about people and whether or not they almost get you killed! "My Recent Business Trip Stay"
The BW is currently under renovation, so the construction workers arrive at about 7:30 am and leave around 5 pm. They are working on the outside, to update many projects. We cannot park right at our room, but have to park across the parking lot, so the workers have access to their current and daily projects. The breakfast was really NICE, as is the staff. The fitness room has nice equipment, which is easy to use. When the outside renovation work is complete the hotel is going to look really nice and appealing. This hotel is remodeling and the place is a mess!!! How can they expect people to stay there??? We booked through Hotels.com which they corrected once we called to complain!!! We got a room across the street at Comfort Inn! "Hotel is ok. Under construction. The manager was very nice." Started off rocky with a couple issues, but the manager was able to fix the major issue with my giftcards. I do think that whoever makes the prices for this hotel should consider lowering the prices while the construction goes on. It's distracting. The rooms are older and having issues with toilets working, ac's etc. The manager was nice, the breakfast was good & the lady who works in the breakfast area was really nice/helpful also. The staff is what makes this hotel very good. otherwise it would be an average place to stay. The outside construction didn't really hinder the stay. It was a little tougher driving in and out of the parking lot but that was all it did. I would stay here again. Room was satisfactory, front desk team was awesome, especially Jason. Housekeeping was great except for the Sunday of my stay. Was told they were short staffed. I would stay again after rehabilitation is done on the hotel. "A Good Stop Even With The Construction"
This motel was under construction when we stayed. It should be a pretty place next time we stop. The stay was pleasant and the price was good. Great hot breakfast and a clean room. A friendly staff helped with the construction problems. Marco O, Thank you for the kind review. Yes we are looking forward to our new look when our renovations are complete. Please consider staying with us again in the future when you are in the area. Jason Russell, Asst. General Manager, Best Western Northpark Inn. "Reservation was canceled when I got there." I made a reservation at this Best Western through a third party (Hotwire.com), and I selected it because it is "pet friendly." When I showed up (after driving for four hours), I was told that they only have four rooms where pets are allowed, all four were taken, and I couldn't stay at the hotel. (And I was also told that I should check with Hotwire to make sure I got a refund.) Granted, I probably should have checked that I could bring my dog, but I've never had a problem before and so I didn't think to. Also, advertising themselves as allowing dogs and getting bookings that way, but then canceling reservations when those rooms are full may work well for Best Western, but isn't great for customers. Anyway, if you're traveling with a dog and intend to stay at this Best Western, be sure to confirm that you'll get one of those four rooms. Older building with outside entrance but a delightfully accommodating staff. Thank you Susan. You made some weary travelers feel welcome. My husband is a disabled Vet with a service dog. Susan was kind, courteous and very accommodating. Thank you. This was our second stay at this hotel. Great Breakfast also. "Horrible hotel, we were evacuated"
I stayed for 6 days. The service was poor, breakfast items were not replaced in a timely manner, the quality of basically everything was low. On the 6th day, bright and early in the morning while I was planning my day, I received a call from the front desk abruptly and rudely telling me they were evacuating the hotel for maintenance and I would have to figure out other arrangements within 1 hour. You can imagine how ridiculous this was in my eyes. On top of that, they offered no assistance and even argued over refunding the difference between the cost of staying there per our original contract and the cost of having to find a new hotel within an hour during a holiday. Thanks Country Inn for saving us. Never staying Best Western again. Very, Comfortable clean quiet. Every thing worked. That's all we need. We were there on business as vendors for the 3 Rivers Art Festival and were only at the place during the night. Nice breakfast as well. "Definitely not a non-smoking room as promised"
Room reaked of cigarette smoke after specifically requesting a non-smoking room because I'm allergic. Didn't bother to request another room, because I was assured the entire property was smoke-free, so I figured we'd run into the same problem no matter what room we were in. Towels and bed linens were extremely dingy, old and rough and reaked of bleach. Booked the room for a quick stay on our Texas to Florida road trip, and while the cost seemed good for a one night hotel room, I still would never stay here again. Would rather pay an extra $20 for a good night's sleep in a room where I'm not rushing to get out the next morning. Cameron in housekeeping has been so helpful and has gone out of his way to help myself and my family. We have been here due to the devastating floods that ravished Louisiana. We lost everything we owned and have been blessed to have someone like Cameron here to help with his kind and caring nature. "A room .,. Not Much More"
This is a really old property, that no doubt has carried other brand names. It is badly in need of upgrading, but would be better if torn down and replaced with a modern facility. The bed squeaked, the TV while a flat screen was an old model and not very clear, the bath towels were small (but not thin), abd the wifi was good as it was cat 5 wired. It is easy to find as it's right off I-12. There were a number of restaurants nearly, but even the McDonald's had only drive-through after dark (not the safest of areas). But then, if you are like us, we stayed here because it was all that was available in the range of our daily drive and one of the few that had a room available. It did beat sleeping in our car. 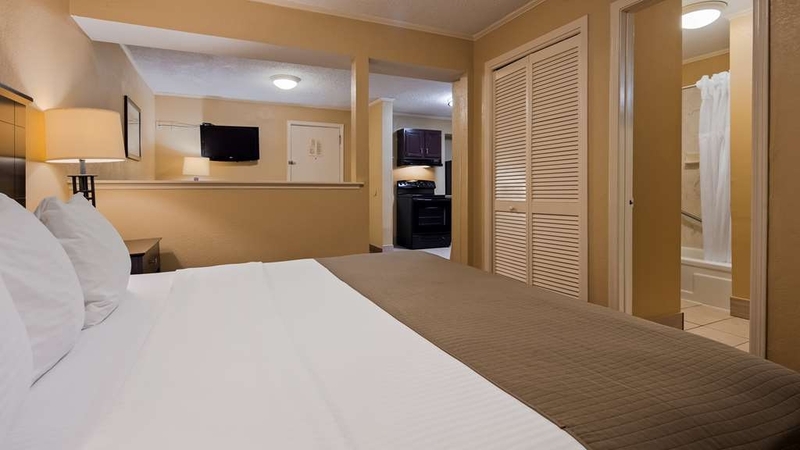 "Run down but pet friendly"
The rooms are comfortable, and relatively clean. The outside areas of the facility are well very dirty, and worn. Breakfast is VERY basic. 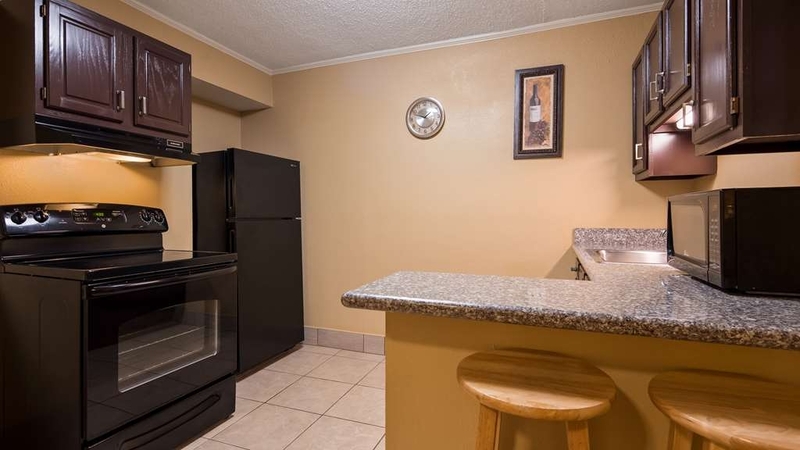 The place is convenient to I-12, however, and it is pet friendly with enough area for your loved one to perform. "SCARED TO LEAVE MY CAR ON PARKING LOT"
Upon opening the door to our room, we were greeted with a swan on our bed made out of towels. Our king bed was comfortable, our room was clean, bathroom area was small. All rooms we're out door entry. Full breakfast, problem was turkey bacon over cooked to hard glass like crisp upon asking host, if she had any more bacon as this was burnt she said she would make some just for me. When she brought the bacon with a smile I was unhappy to find she had burnt more bacon just for me. All in all this is a nice clean safe place to sleep, just hope your not hungry in the morning. We would stay again. Serve desk was very nice at check in. But please please teach that lady how to cook. Been staying at this location since 1990 on and off the staff are great and the nicest people and the place is always fresh and clean The gym is super the hot breakfast is great and Andrew at the desk is great also. I have stayed here before and it is a clean comfortable place to stay. This stay my room was up and over the lobby. It was very quite, clean and a room I would ask for when I return. Breakfast wasn't any thing to get excited about but it was ok, the bacon was more like jerky, everything else was ok. Still a great place to stay even if I brought the wife. "Quiet travellers hotel close to the interstate." Despite the sign being renovated and not being seen, I found it. From the check in until check out, I was pleasantly surprised at how comfortable my stay here was. Upon arrival, the ladies atthe front desk made me feel very welcome. They were very friendly and helpful. My room was a little small but comfortable for me. There was plenty of parking and the swimming pool out the back was the hidden treasure. The entire complex was clean and well signed. Breakfast was self serve and whilst the room was a little small, it was also well stocked and clean. The bed was comfortable which was important after a long drive. Check out was equally as easy and I would recommend this hotel to anyone looking for accommodation in this area. "Awesome hotel. Highly recommended. Safe, clean. Friendly staff. Doesn't get much better than this." I requested early checkin on arrival and a ground floor room. Front desk was very accommodating. Very friendly and helpful. Great hotel, exceptionally clean and in a quiet location. Room was very comfortable. Best nights sleep on the road in a long time. Breakfast selection was great with fresh fruit, eggs, bacon, potato, cereal and fruit bowl amongst others. Great location and access in minutes to great area restaurants. I was so impressed I cancelled my stay at another hotel in Slidell and booked another three nights here. This is the kind of hotel I would let my wife stay in if she were traveling alone. I will be back if I am passing through the area again. I have stayed a few times at this hotel and it always clean and quiet. Breakfast choices are just enough. Price is good. Bed was a little lumpy for me but I sleep on a tempurapedic so I am a little spoiled. I have paid for more expensive hotels and they are never as clean as these rooms. I really appreciate that. Andrew, front desk clerk, called a bit after my check in to ask if the room was good and if I needed anything. Thanks for another great stay. I always stay at this location when I am in town. It has everything you want/need. The staff is always nice, rooms are clean and comfortable. The beds are very comfortable. I sleep very well when I stay here and it's close to everything. The breakfast is also excellent. The room next to my room was smoking and we had an adjoining door,which made it even worse.We complained to the motel manager,but the issue continued til we checked out.Now our luggage smells like tobacco smoke. I was not happy and may not stay here again. I stayed at this hotel for one night and had a good experience. Rate was competitive, room was comfortable, staff was efficient and helpful. Breakfast was ok but not enough tables for everyone to sit. I would stay there again. "OK place if you've got pets"
We had to stay here in a pinch one night as it's one of the few places in the area that accepts pets. It's a decent budget hotel, and the pet rooms are on the first floor, which is nice. The room was clean, and good sized. The main complaint would be the renovation didn't get rid of the popcorn ceiling, which is very noticeable since they are only about 8 feet high. Noise level was OK as we were near the back. If you need a place that accepts pets, this one is pretty good. "Towel swans and note on bed were a nice welcoming touch!" Very pleasant and comfortable place to stay when away from home! The desk clerk was exceptional and welcoming, she told us where everything was located in and around the hotel. She even made sure we knew the Wifi password and about their breakfast in the morning! This is a good hotel for the price. We stayed in the suite, which had just been updated and was roomy and comfortable. Friendly staff. Breakfast was fine, though dining room is very small. The entire hotel had a funny smell when we were there. Perhaps partially from construction going on but smoking area right outside door didn't help. Pool is a walk across the parking lot, which we didn't use due to being early spring. Would stay again if the price difference was significant but not first choice in town. "VERY GOOD... BUT DITCH THE TOWEL ART!" Best Western's been my go-to both before and since retirement, all over the country and even Paris (France) once. My ONLY complaint: I really hate the way your pillows are jammed into cases so they form small lumpy uncomfortable little squares that are diagonally lined up like dominoes at the head of the bed. And why waste housekeepers' time, folding linens into swans? (Otherwise, bedding is always good.) Rarely any other dissatisfaction. Joannh254, I am sorry you experience was not up to par. We are about to start a renovation of our property and look forward to having you back so we can serve you again. As far as the hold on your credit card, since you booked the room with an online service, we have to take a fee for any incidentals because the we do not have a credit card number from the online company. Next time, I invite you to book straight with us or the national Best Western hotline at 1-800-Western. You are guaranteed to get the best rate there! Please contact me directly so I can discuss you concerns at 985-892-2681. Jason Russell Front Office/Guest Services Manager Best Western Northpark Inn Covington, La. Even though it was older and had outside corridors, the service and internet speed made up for it. Housekeeping and the management more than made up for the worse hotels we stayed at — they were very considerate to our situation with the Service Animal, and the general manager personally made sure our stay was excellent. The pool is outside in the back, but was very clean and wasn't crowded. The only downside was some kids running around yelling at 1am, but a call to the front desk ended that. I would recommend this to anyone travelling. Justin T., I am happy that you and your service pet had a wonderful time at our hotel. Please do not hesitate to stay with us again if you are in the area. Next time try our room with a full kitchen in it if you are staying for a longer period of time. Jason Russell Front Office/Guest Services Manager Best Western Northpark Inn Covington, La. This is a very good, clean, accommodating motel. Its not the Ritz, so I'm not reviewing like it was. Room was decent and tidy. Staff was friendly and attentive. Parking lot was well-lit. I saw security patrolling. If you need to pull-in and rest, then you could do much worse. James B, Thanks for your great review of the hotel. I am glad you enjoyed your stay. Next time you are with us, make sure you try out our pool! It is open from 9 a.m. to 10 p.m. each day! Jason Russell Front Office/Guest Services Manager Best Western Northpark Inn Covington, La. We just stayed one night but the staff was friendly and accommodating. When we arrived early they checked us in and then called when room was ready. Pet friendly and provided dog bed and bowls. Very sweet touch! Very convenient location and also enjoyed a dip in the pool. "In Covington for a Wedding"
Spent 3 days. This hotel was ok, nothing great. Room was musty, If there was availability at another hotel we would of changed. Beds were not comfortable. Seemed like this hotel was more for construction workers on jobs or people passing through for 1 night. "Good standard hotel experience "
nice place to stay with great access to local amenities and New Orleans across the lake. Just far enough out to be away from the busy city center. Staff is very pleasant and rooms were very clean and bedding was nice as well. Bathrooms are very very small. Much smaller than most I've stayed in. The staff at the Best Western North Ridge in Covington was very helpful. The facilities were very clean. I look look forward to returning there in the near future and I had a splendid vacation. The food in the area was fantastic as were the people. 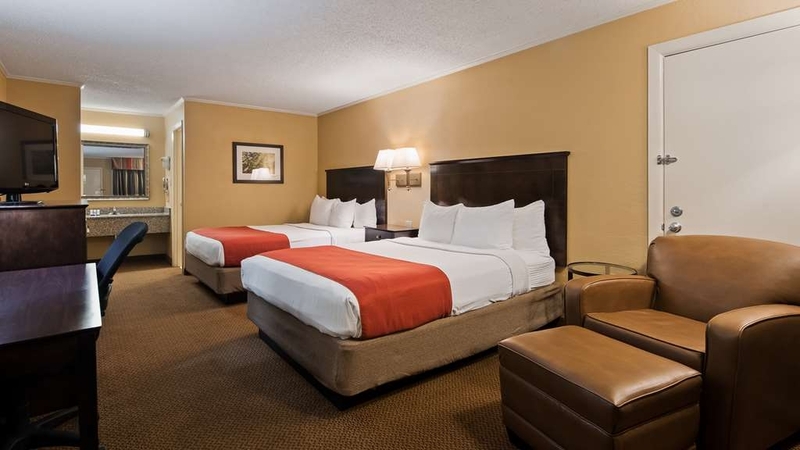 The staff is friendly, the beds comfortable, the access to I-12 very convenient. We were there visiting relatives and enjoyed the close proximity to New Orleans and Lake Pont.... The area, this time of year was quite pretty with blooming flowers and trees. Nice place to stay traveling east or west through Louisiana. BW13802, Thank you so much for your kind words about our hotel. 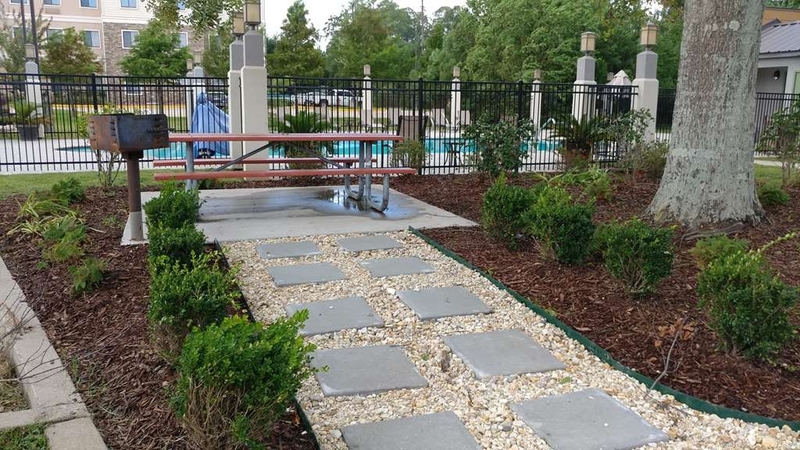 We strive to keep our hotel in tip top shape and keep the landscaping beautiful. I hope you had a chance to try our complimentary hot breakfast while you were here and I looking forward to serving you again should you pass through this area. Jason Russell Front Office/Guest Services Manager Best Western Northpark Inn Covington, La. This was our first stay at a Best Western and we were very pleased with everything. The staff was very pleasant and helpful. The breakfast was adequate and presented in a very attractive manner. Checking in and out went fast. I will be staying in another Best Western Hotel this summer. Perry3647, Thanks for staying with us. I am happy that you had a great experience with us and and hope that our complimentary hot breakfast met your expectations. Please don't hesitate to stay with us again if you are in the area. Jason Russell Front Office/Guest Services Manager Best Western Northpark Inn Covington, La. love the old way, no formal entrance, and pull up to to your back door and unload. great service and staff, personality fabulous clean room good access to ice, exercise room etc breakfast short of my expections. mikn0d, Thanks for the review of our hotel. Many of our guest like the outside entrances and our staff does their very best to make our guests feel welcome. I am sorry that breakfast didn't meet your expectations but we are going to offer a bit more variety in the future so I hope you will give us another chance to serve you. Jason Russell Front Office/Guest Services Manager Best Western Northpark Inn Covington, La. The staff was so friendly and everyone always smiling. The hotel, inside and out has to be the cleanest I have ever been to. The rooms were very spacious and the beds were super comfortable. I highly recommend this hotel. nharr, Thank you for your review. I am happy that the beds met your expectations. 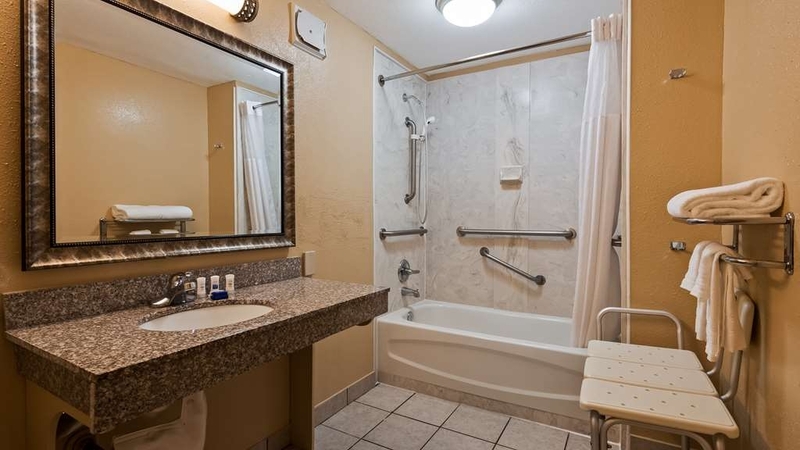 Next time you are here, check out our room that includes a whirlpool bathtub. It's great for a time of relaxation! Jason Russell Front Office/Guest Services Manager Best Western Northpark Inn Covington, La. I have stayed at hundreds of different hotels...never Ritz-Carlton...but very, very nice ones (and bad ones as well.) Never have I walked into a hotel room where the presentation was so welcoming, I felt like I was on an exclusive cruise. Kudos to housekeeping, management and the front desk staff. "I'm headed here a second time ... !!!" room in excellent condition, very cool upon my arrival, clean, 2 lge comfy queen beds, it has everything I needed except a kitchen unit; excellent staff, great location ... lot of eating places nearby; very accommodating service; just didn't have a kitchenette which would have been super! Overall, my experience was great ... I'm headed back to this same location next month! 1st time and last at Best Western....it was a pet room which had an odor, air cond. barely worked in April, sink stopper didn't work for shaving, sink and toilet were extremely low height I guess for wheelchairs but very uncomfortable for most, pillows not good bring your own, noisy stompers above us, lots of construction workers during the week, then lots of blacks and loud rap music on the weekend in the parking lot.......NOT a good place for us!! The room was neatly decorated and clean. There was a wet spot on the floor in front of the bathroom that was a little strange. I am not sure if the ceiling was leaking or if something was spit and not clean up very well. It was SOAKING WET! Also, My biggest problem was the bed it's self. The pillows were great and the bed cover was fine. However, the mattress needed to be replaced. It was HORRIBLE! I got absolutely no sleep during my stay. It was all springs. If you sat down to hard it felt like you were going to bounce of the bed. There was no cushioning on top of the mattress either. Like you could feel every spring and hear every spring. If the bed would have been of better quality it would have been a completely different experience. The room was clean and there were personal touches from the staff to complement the room. But the most important feature, the bed, was terrible. Sometimes, a hotel is ho-hum. This one is a hoped for clean, airy, and convenient. The aspect setting it apart is the people! Very courteous and helpful. Made my wife and I feel at home. The landscaping added a nice touch, too. While this Inn will not WOW you the staff is amazing and breakfast is as good as you would anticipate at even the nicest of Best Westerns. The rooms are standard, but very clean and comfortable. If you are in the area it is well worth the price. A few weeks ago, I stayed in the Best Western in Covington, Louisiana. I have to say that I was both pleasantly surprised & pleased from the moment I walked up to the check-in desk. The young man who waited on me was very helpful, courteous, & nice. I asked for a room close to the office since I was traveling alone & he immediately determined which room I needed to be in. When I unlocked the door to my room, I was amazed at how clean it was and was greeted with a "Towel Animal" on my bed just as if I were on a cruise. Certainly wasn't expecting that cute little surprise. The bed was comfortable & everything I needed was already provided in the room. The next morning, I was treated to a delicious, hot breakfast. I would advise anyone traveling near this area to obtain a room here. Front office staff provides quality customer service through their helpful and friendly personalities. 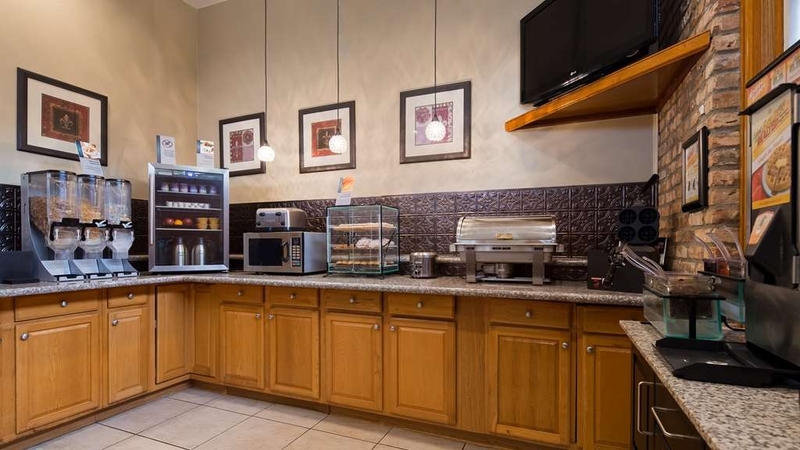 Breakfast was pleasant and of quality that you would look for at Best Western. Beds are a uncomfortable and rooms could stand to be a little cleaner. Overall our stay rates a solid B.
I stayed here for a week after losing my home to the flooding in the area. The staff went above and beyond to make our stay comfortable. Mr.Walter made a huge impact on us and our kids. After being cooped up he brought us an old sheet so the kids could Picnic and get out the room. I highly recommend this place to anyone wanting to feel at home. I felt very safe and comfortable in their care. I will always pick that Best Western if we decide to stay in that area again. They let us switch rooms when I found out we only had a single bed room. We got one with two queens, which was a lot better for me , my daughter and my friend and her daughter. We had a small dog with us on this business trip. When you get a designated "pet" room you expect a Pet Room. This was the cleanest Best Western room we have ever been in. Ok breakfast. Was very convenient to interstate12. Was close to many good restaurants including Acme Oyster House which is as good as the one on the other side of the lake in New Orleans. This is a great hotel for this part of Louisiana. I stayed here from the 13th to the 15th and everything was great. The room was clean, everything looked great. Desk help was fantastic. Mini breakfast was just enough to wake up and grab a bite and go. Close to many things. Will def book here every time I visit. We stayed here for three nights and were very pleased with our room and location. They are pet friendly with dog beds and treats! I would recommend this hotel and would stay here again. We had a good breakfast in the mornings and never heard any housekeeping before we were up. Very friendly staff will help you with about anything you need! I have stayed here several times in the last few months. Pamela at the front desk is always exceptional, as are Yessica and Marisela in House Keeping. Lisa does an excellent job with breakfast. And Walter keeps things running smoothly in maintenance. All-in-all, I love staying here. It is a good retreat from home and their WiFi is outstanding. Plus they provide Community Coffee. 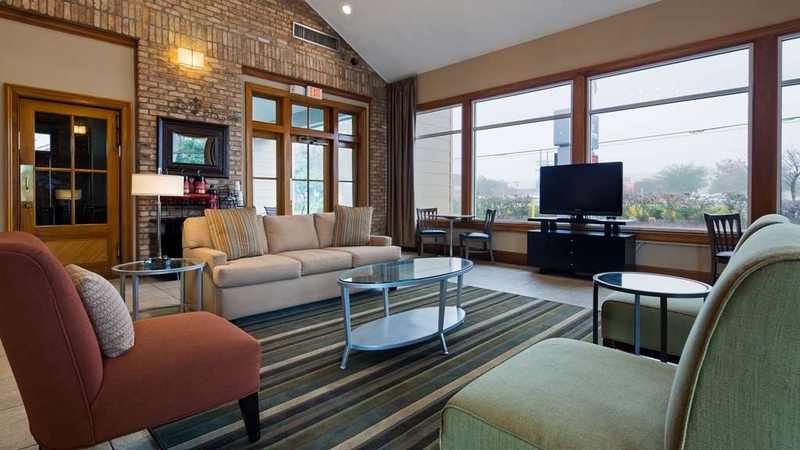 If ever you are in Covington and need a place to stay, I think you will enjoy BestWestern NorthPark Inn. 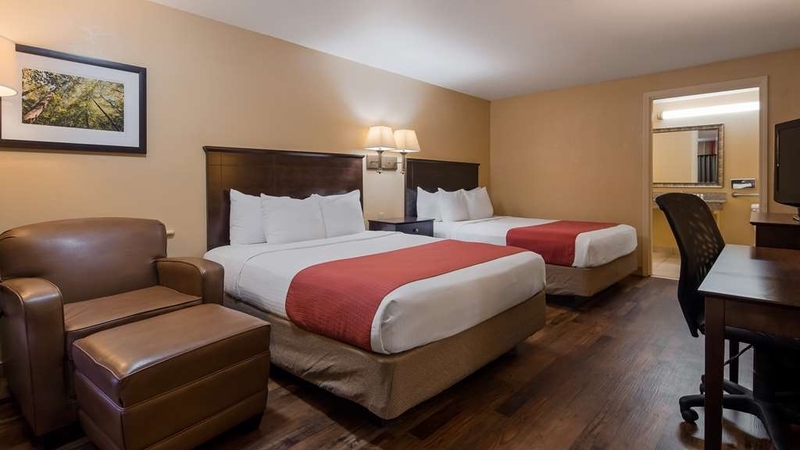 "clean hotel rooms with great service"
"What a great staff and a very nice place to stay"
We are struck by the friendliness, and support we experienced during our stay here. We arrived during a storm looking for shelter and found a most agreeable, updated room with a wonderful fine dining restaurant next door. After a comfortable night, upon leaving, our camper hit the porte-cochere at the entrance to the motel destroying our AC unit, The manager (Sandlip Chauhan) was very helpful. Mr. Chauhan is an excellent manager with a very good team. He helped us find an RV repair centers and gave us a room to stay while collecting ourselves and make arrangements to resolve our camper issue. He also had a couple of his maintenance staff help us. Walter, the maintenance supervisor, helped get the damaged AC unit off the camper so we could travel safely and Mac was helpful with ladder and cleaning up the mess. The staff at the desk were also extremely accommodating. Thank you to all for your kindness and assistance. You were wonderful. Truly Good Samaritans to travelers. Pamela was working the night of our drive through LA. Due to rain and very old windshield wipers, we decided to stop earlier in the night! Traveling with a large dog is difficult to find accommodations so last minute. After calling four different hotels near the area, I was told that not many hotels are pet friendly! One last attempt, I called Best Western Northpark Inn, a delightful voice answered and was more than happy to help! We got a snazzy pet friendly room, that even came with a doggie bed!! Ample room in the rear of the hotel for pets to potty, WITH GRASS! (most hotels we stayed in throughout our week travels didn't have as nice as a pet area, let alone offer clean up bags!) We booked two different stays at another Best Western in a different state a few night previous. Pamela was the only one to make us aware of the Best Western Rewards!!! Earning 10 points for every dollar spent is a pretty cool incentive and selling point if you ask me!! Very pleased with our stay at Northpark Best Western! Stopped in for a night and Andrew Sandoz at the front desk was sunshine to see. He was welcoming, friendly, joking, everything we needed right then and he seemed to know this. The rooms were clean, quiet, very comfortable. We would certainly stay here again. "Comfortable, clean, friendly + great breakfast"
Andrew (I think I'm remembering his name) at the front desk was very helpful, courteous and efficient and had gorgeous hair! The woman running the breakfast buffet was kind and did a lovely job keeping it tidy and well-provided. The room was very clean - my nearly-2-year-old was all over every thing and I never hesitated b/c it was all so clean. Likewise, it was very quiet. The breakfast was a generous spread with good proteins, breads, cereal and oatmeal, fruit, juice and coffee. Stopped in Covington on a road trip and stayed here. Russell who was working the front desk was so helpful and polite. The two gentlemen working the front desk in the morning were also very helpful. Breaffast was nice. Rooms were extremely clean and modern. "Wonderful Hotel I could ask for. " Me and my three friends had the most amazing stay here at Best Western. Not once did we wait more then 5 minutes for anything. The rooms were heavenly, and beautiful. The front desk Sanddid was just helpful. Love the chats we have with him. Not to mention the food runner Kerry she was fabulous! Wonderful morning chats with her and was considerate about if we wanted anything left before she took it away. Finally, our housekeeper was adorablly kind. She filled our requests to a T. I will deffinately come back here again with my friends. Hotel was very nice, beds were comfortable and staff was great and friendly. Breakfast was okay. Only had an issue with the bill, they charged something to my card that they did not disclose to me about. I have stayed at many levels of hotels in terms of star ranking and quality. 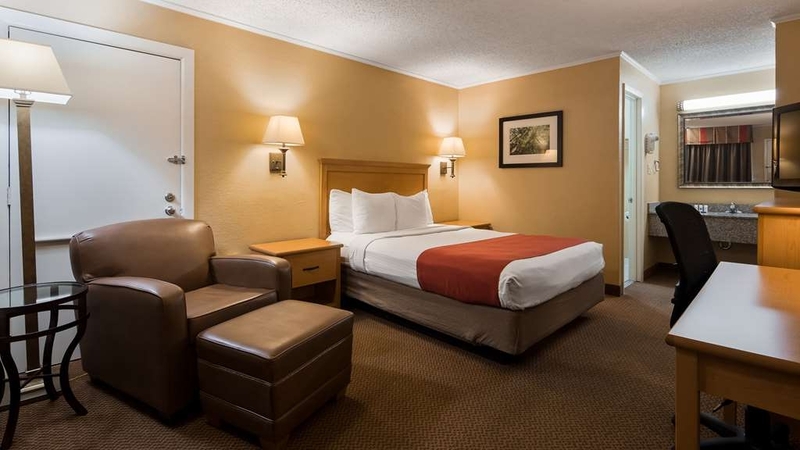 The Best Western-Northpark Inn was simply solid in every category. The rooms are clean, the cleaning staff takes great pride in their work, the continental breakfast was well stocked, clean and attended by a very hard working lady making sure all of the food bins stayed full and functioning. The front desk was extremely helpful no matter who was working it. So although it is not a luxury hotel, every aspect of this hotel was rock solid! 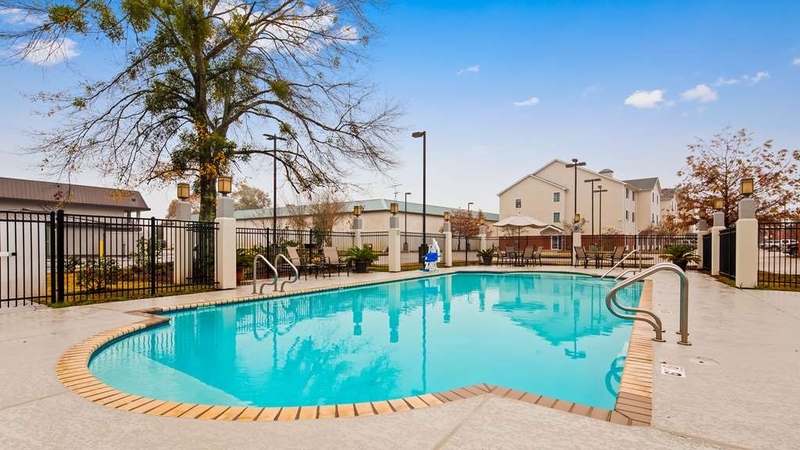 A solid value and convenient to New Orleans (about 45 minutes drive). "It was very noisy and we ended up paying double for the room"
We booked this room online and paid for it. When we got there, they said that we were suppose to be there the previous night and we were charged for that night. We also had to pay for the night we actually paid, so it ended up costing us $250 for one nights stay. We also got a pet room and there was a very weird smell in it. We always have a pet room and have never had a problem with smell before. The rooms also open to the parking lot which I don't care for. I won't be staying here again. It is a good hotel with great location and nice staff. It features a comfortable bed with a decent room and very good cleaning staff. There are many very good restaurants very cklose by which range from moderate to posh pricing. "Clean! Convenient! Courteous! Can't beat it!" Stayed here 3 nights visiting family. Hotel management knows how to pick qualified staff! Some of the best..ever. Friendly check-in, friendly housekeeping, friendly in breakfast area (that Lisa is amazing!!). Clean room! Convenient location! "Worth a few extra bucks"
Room rate was about $4 per night more than lesser tier motels in the area, but the stay is worth it for the expanded offerings on the breakfast alone, including several hot breakfast choices. Room was well-appointed and comfortable. Housekeeping service was commendable. I've stayed for a few weeks at a time the last few months, and it has been an excellent experience. Pam at the front rest has been wonderful,very helpful, with a bright refreshing smile. Walter and excellent maintenance man keeps everything running smooth, and is johnny on the spot,when it's not. The cleaning ladies ,Kendra,Dunia,Yessica,Marisela,and Gloria are amazing.They've been very helpful and keep everything in perfect order. My mom now lives with my brother. She well be 92 years young on January 2. Had a great time seeing all of them. Went to New Orleans with my wife for her first time, my 6th. Just as I remember so mush fun. "December 3, 4 & 6, 2015 stay"
Great Hotel, one of only a couple in the area that allow pets. Room very clean, beds comfortable and good location. Staff great even those that works on Thanksgiving day. Breakfast was good but did get boring after a couple of days. "Great Hotel with along with the service." Hotel is clean and well maintained. Rooms and carpets are clean and neat. Beds are very comfortable. The thing that stood out most was that the hotel even cleans the remote controls for the TVs. (most hotels don't do that). Was very impressed. The staff is very kind and helpful, and are willing to satisfy any of your needs. 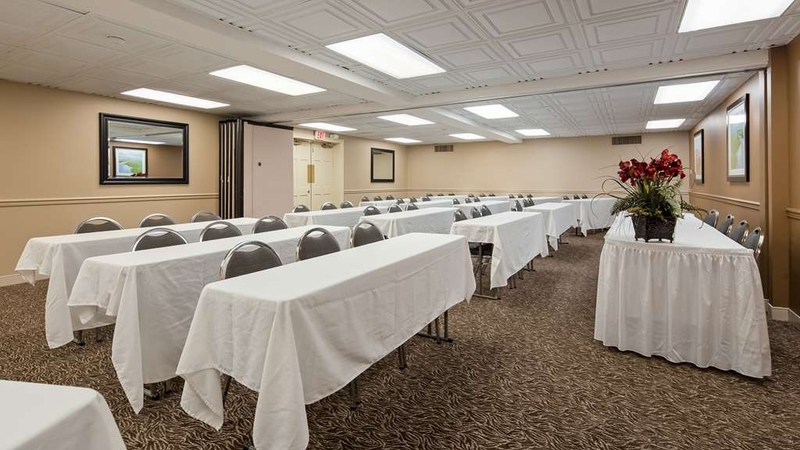 "Good budget choice in the Covington area..."
Room was on the top floor. Everything was as I expected per other reviews. Breakfast was adequate and typical for this type of motel. The 2 things that stood out to me were the cleanliness of the property and the concern, knowledge, and friendliness of ALL of the staff. They made me feel welcome and I could tell they took pride in providing good customer service....The only thing that didn't meet my or exceed expectations was the comfort level of the bed. We had a single queen upstairs. The mattress was in need of replacement. I didn't complain because the excellence of everything else overshadowed that. I would stay here again and for the money...I would find it hard to beat as a choice in the Covington area!! We have stayed the Best Western a couple of times now over the past 4 years. 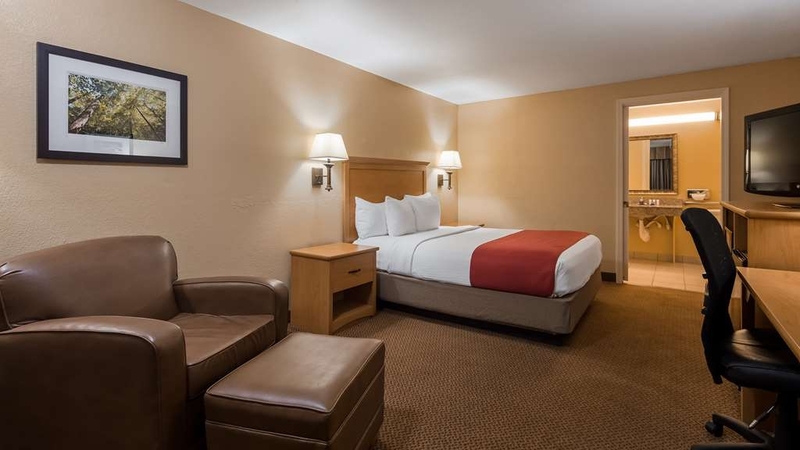 Clean room, super nice staff, a comfy bed, and wifi that will stay connected. All the things that we need when we are staying at a hotel for business. "The only place I'll stay when I head to New Orleans"
"Wonderful, friendly customer service, clean comfortable room"
Great stay here at Best Western in Covington, LA, all around. Helpful staff. Great customer service, clean room, comfortable bed, and a home away from home. Joe, the maintenance man, introduced himself to me and asked if he could do anything to help me with my stay. I'm driving cross-country for a new job and was interested in learning about the area. He told me all about Covington and cities on my route, interesting places to see, was very friendly, welcoming, and helped me with directions. Two thumbs up! Kudos to Jessica who greeted us with a Welcome note and 2 swans made from the room towels on the king bed. The cleanliness of the room was uncanny! No dust anywhere!! Yes, I ran my finger across the top of the headboard, behind the tv and the windowsill! I had to. The bathroom, shower and commode.. clean! All room ammenaties were stocked and the refrigerator and microwave were clean and in perfect running order. The room was immaculate. Kudos to Lisa for keeping the excellent breakfast bar, clean, hot and plentiful! If this is your choice for an overnight stay, you won't be disappointed! Andrew at check-in, was very friendly, and had the information we asked about on a handy area map. Sandip, was the most friendly and welcoming manager, I personally every encountered. Meeting the Housekeeping Supv., Kendra, was wonderful, a sweetheart, eager to fulfill any needs. Then there was Brennetta, the beautiful soul of this woman, was so refreshing, in the hotel world. Her breakfast bar, was full of delightful treats, and it was clean, and inviting. On the morning of our departure, we received the most warm and heartful goodbyes, with HUGS! A wonderful place to stay. "What an Awesome place to stay!" This hotel and staff are some of the best I've ever seen. They are friendly and go way beyond the expected to make your stay perfect. The rooms are great, food good, staff super. I'll definitely be be back soon. "Friendly, Clean, Price is right"
I was very pleased with my stay here. The beds were comfortable and the rooms were clean. I enjoyed breakfast as well even though the lady Pam stepped out for a cigarette break which was very unpleasant to watch. Afterwards, she returned back to prepare breakfast. I was amazed at the front desk lady Dominique. She made us feel welcomed and also kept hot fresh coffee out. Overall, I enjoyed my stay and will definitely return. "Decent place with thin walls"
We spent four nights. It's a decent place. People are friendly, pool is nice, breakfast is decent and the lady in charge of it is super-friendly. Location was good. That said, the only place I've ever stayed with thinner walls was a Motel 6 about 25 years ago. Could not get over being able to hear our neighbors' TV clearly -- on either side of us, and well past midnight. I don't think they were blasting the sound. I really think the walls are paper-thin. The pillows were numerous, polyester, lumpy, and oddly square. No problem for me as I travel with a pillow. Bed was very comfy, however. Lots of parking available. Overall, a decent place, but the noise level means we won't return. Andrew was a terrific check in and check out person, friendly and sincere. First rate, definitely management material. The breakfast was good, and the staff their very helpful, too. This was a great value for a moderately priced hotel. The pool was spotless, too. I love this hotel. It is as comfortable as being home. It has all the comforts of home. The location is perfect....close to everything. I stay at this hotel/location every time I am in this part of Louisiana. The beds are comfortable. They provide good complimentary toiletries. There is an iron, ironing board, microwave, refrigerator, hair dryer and coffee pot in every room. All the amenities I normally look for. No need to look any where else. They even have an excess of power outlets! Most hotels don't have enough of them. I wouldn't stay anywhere else. BYOP (bring your own pillow) - neither the bed or pillows at this hotel were comfortable. There was one light that didn't work, but I never did sleep well no matter what I tried - pillows were "small" and numerous but no one combo felt comfortable.